The bare branches of the tree tapping and scraped on the kitchen window. She shuddered. Goosebumps shivered up and down her arms as she pulled her jumper tighter. Had it got colder? There was only one egg left. She lowered the spatula. Bit the inside of her cheek. Looked at the stand mixer. Couldn't continue with her cake plans. And decided to make walnut whips instead. You will also need four silicone dariole moulds. Mine were roughly 9cm high. 1, Melt the chocolate and paint the inside of your dariole moulds with a layer of chocolate. Leave these in the fridge to cool before painting with another layer. Return these to the fridge until you are ready to fill them. You won't use all the chocolate up yet, we need some left over to cover the bases. 2, Make the marshmallow filling by putting the gelatine and cold water in the bowl of your stand mixer. Stick on the whisk attachment so you are ready to go when your hot sugar syrup is ready. 3, In a medium sized saucepan add in the golden syrup, caster sugar and a good couple of splashes of water to cover it. Set over a medium high heat and stir until the sugar has dissolved. When it has all dissolved, stop stirring and use a damp pastry brush to remove any rogue sugar crystals from around your pan. If these fall in, they could trigger crystalisation and that would be a bummer. 4, You want to boil the sugar syrup until it reaches 140o/c on a sugar thermometer. When it has, remove immediately from the heat, set your stand mixer to a medium speed and with it running, pour a slow trickle of the hot syrup directly into the bowl. Try not to hit the spinning whisk attachment. Or you end us with a whisk attachment that looks like this and hard sugar crusted over everything you love. (inside of your stand mixer bowl). 5, Keep the stand mixer running until your marshmallow turns white and has the consistency of really sticky bubble gum. This can take around five minutes but keep an eye on it. 6, Wrestle the marshmallow into a pipping bag. You don't need to both with a piping tip. 8, Using some of the left over chocolate, cover the top (which will be the bottom) so that no marshmallow is peeking through. Again, keep a bit of the chocolate for sticking on the walnut halves. Stick these back in the fridge for at least an hour. 9, Unmould the whips from the silicone moulds. Using the very last of the chocolate, use it as glue for sticking on the walnut halves. Stand back and admire your handiwork. Eat these within a day. It's not hard. Thank you Nazima, no problem at all getting them out of the moulds, I used silicone ones so they could literally be peeled up and off, wouldn't want to attempt this with metal ones though! I've been there many times before, never enough eggs! 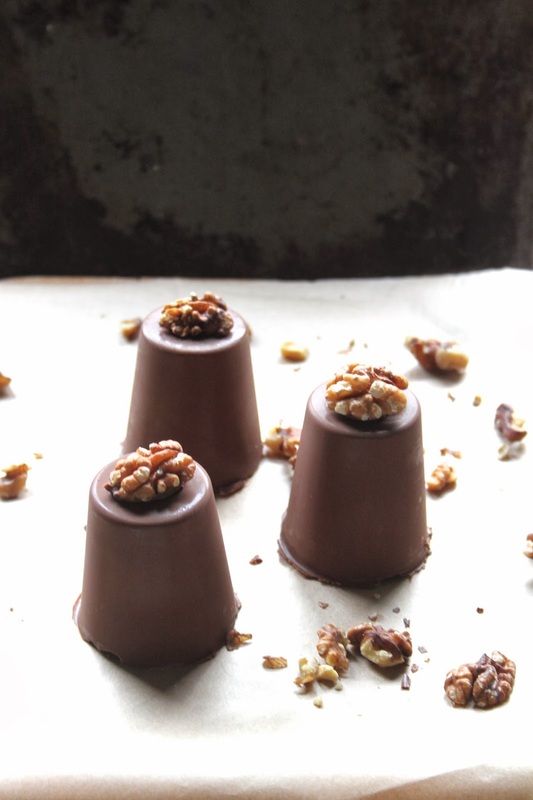 Love the idea of making your own walnut whips. They must be so much more satisfying. They look great! Thank you Hazel - it's my own fault for not checking before starting but a good thing came out of it! Scrumptious! I have just read in the newspapers that marshmallows are the new cup cakes, your ahead of the curve with these lovely creations, I will have to make some. Thank you :) I love making marshmallows, Christmas is coming so it's the perfect time for them too!